There are literally hundreds of ways of wrapping a sari! 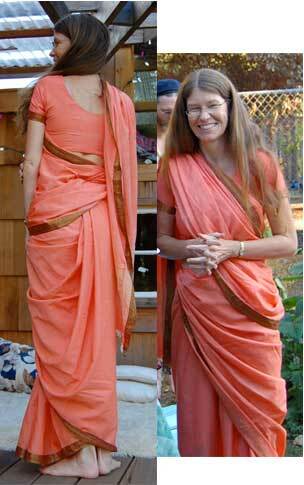 A definitive authority on Sari draping is Chantal Boulanger, who has done extensive research learning and documenting the different regional sari drapes of India. She met with a tragic death while on vacation in Africa Dec. 2004. A sad loss for the world of draped clothing. Chantal was dedicated to her cause and went to the farthest corners of India to learn new drapes. Despite language and cultural barriers the women she met were mostly very happy to share their knowledge. She learned the drapes in depth by wearing them herself, until she'd really figured out the fine points. Her ground breaking book Saris: An illustrated Guide to the Indian Art of Draping features over 80 different draping styles explained and illustrated with easy to follow instructions. You can now buy the book directly from the sarisafari sarishop! The ubiquitous sari and elegant drape worn with a petticoat and choli. Read how to step by step drape this style. This easy to wear style looks great with your normal wardrobe of sweaters and tops. The center pleat is drawn through the legs to make an almost genie pants look! A treat to look at and fun to try yourself. You can see more ways they wear mundus here in Trivandrum's beach areas. One of India's most elegant, easy and flattering drapes. 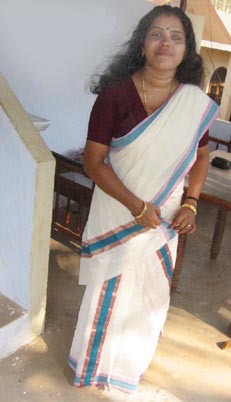 Two large pleats in the front and the pallu of the sari is draped twice over the torso. This unique drape is found in the coastal areas of Andhra Pradesh. This graceful sari drape features pleats in the back and the pallu passed is twice around the body and arranged in lovely pleated arcs. A pleated rosette back with a beautiful pallu drape make for unique style that can be worn without a petticoat. A great way to drape that opens up new draping ideas. 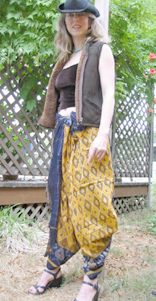 For those of you that sew and want to make your own cholies, you can buy a stretch choli pattern from the sarishop, or check out the folkwear catalog on line. Their "SE Asian tops and wraps" set has a pattern for a choli, as well as other interesting designs that would look great with your sarees. We stitched their Thai blouse pattern at a shorter length and Carol wears them as winter cholies. Another great option is the Nepali Cholo pattern available in the Sari Shop - it is a front wrap lined jacket with adjustable ties. Try experimenting with some drapes of your own. Fold the sari in half lengthwise and tie it like a dhotie at the waist, tuck in a couple pleats and draw the rest around and tuck in your back waist for tailfeathers. You can do whatever you want with a sari, including tying it around your waist like a sash. There are no rules and it's amazing what you'll come up with trying. If you find something you want to share, let us know!